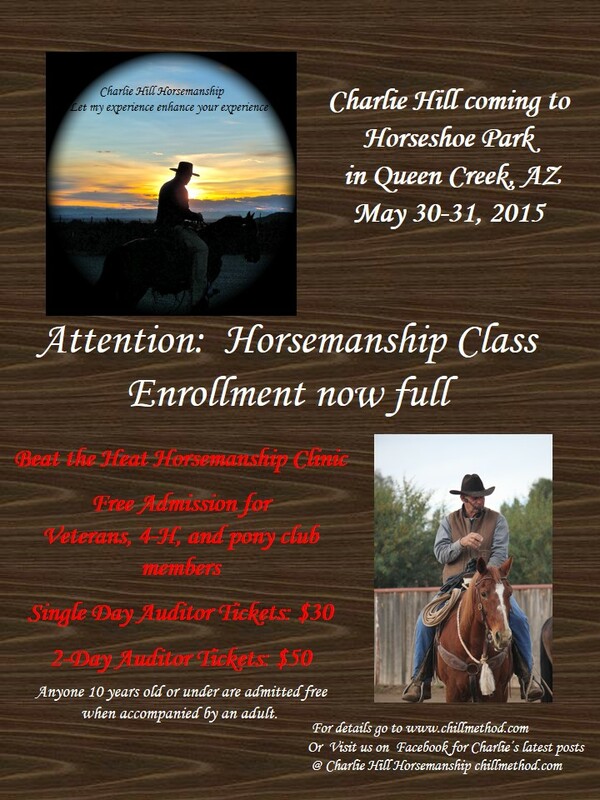 The “Beat the heat horsemanship clinic special” will be held in the great covered arena venue at Horseshoe Park Equestrian Center in Queen Creek, Arizona, on May 30, 8AM to 4PM, and May 31, 9AM to 5PM, 2015. The price for a single day is $30, and for a 2-day ticket is $50. Tickets will be available for purchase at the clinic as well. Any veteran will receive a complimentary free admission auditing ticket. There will also be complimentary free admission tickets available for any 4-H or pony club members. Anyone 10 years old or under are admitted free when accompanied by an adult. For anyone to decide whether this Horsemanship Clinic is for them or how they may benefit by auditing or participating in it. I will explain the intention of this clinic and how my clinics are conducted. I define Horsemanship as,” the understanding of your horses’ movements and thoughts and how one influences the other. It is recognizing your responsibility to the horse in all situations. It is the ability to arrange these thoughts and movements to obtain a willing service.” It is my intent as we work with your horses, to bring awareness as to how his thought is influencing his movement and how by your influence over the movement, you can change his thought. I intend to point out your horses’ needs and encourage you to take responsibility to support those needs, by increasing your understanding of better equitation and being able to arrange the thought and movement to a willing service. The class will be divided into smaller groups, so you will not need to be in the saddle all day long on day 1. Each group will ride once in the morning and once in the afternoon. This will enable you to have an opportunity after your session, to come back again after digesting vocabulary, application, purpose and observation of others. On day 2 in the morning, it will be the same small groups and in the afternoon, all one group. There will be demonstrations and individual work throughout both days, whenever appropriate to benefit the majority. The mission of this clinic is to learn how to improve the horses’ performance without increasing the horses’ anxiety by better equitation. This study can be conducted by the subtle changes required to improve horses that are already preforming well. Often times many of the most basic needs of the rider or horse, gets revealed from the situations where issues evolve ie; the horse that gets nervous, rears, lazy, refuses, shying, won’t slow down, etc. Don’t miss this opportunity to get the insight from Charlie Hill.